If the same old lifts are getting a little stale, try one of these 12 uncommon movements for anything-but-common muscle and strength gains! As important as basic bread-and-butter exercises are to master, sooner or later doing the same movements over and over again gets boring, and you'll hit a training plateau. Fortunately, the Bodybuilding.com Exercise Database has hundreds of options that range from bodyweight movements to kettlebells, bands, and free-weight moves. Rather than overwhelm you by exposing the entire vault, we've selected 12 exercises that may be completely new to you that you can easily insert into a stale body-part routine. The information in this article will help you figure out how and when to use each unique movement. You can then view a demo of each exercise and read step-by-step instructions with a click of your mouse. You might like what you see in the vault so much that you become a regular user, sampling new exercises in place of ones that need to be retired. Just remember, if you're unfamiliar with any of these movements, start light and master the form before attempting heavy weights. You're lying on the floor. You're doing one side at a time, and your body is in a position that you're not accustomed to. This alone will make this movement a tension-generating battle that will defy any expectations you have on the front end. And if you want to make it even more difficult, simply use a kettlebell instead of a dumbbell. Go heavy with bilateral movements first; you can do these later before or after other single-joint chest exercises. Do 3 sets of 10-12 reps.
Don't let your elbow touch the floor between reps. It should get close, but not go all the way down. Also, keep your upper arm out wide to your side to better recruit the pec muscles. Similar to a straight-arm pull-down combined with a pull-over, but you can't use body English while benched. 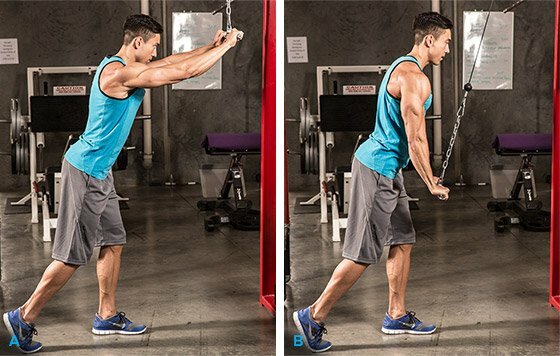 As a single-joint lat exercise, perform it last in your back workout for 3 sets of 10-12 reps. Ensure the bar goes all the way toward your thighs since your lower lats are more actively engaged through the bottom portion of the range of motion. 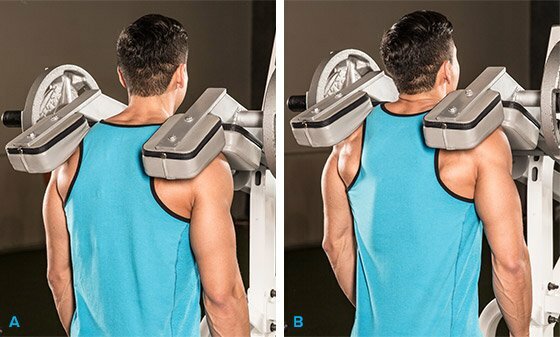 This combo shoulder and rotator cuff movement isn't your typical seated dumbbell press. It starts in a scarecrow position with your arms parallel to the floor, hands hanging straight down. You start with external rotation and then go right into a shoulder press. This makes a good warm-up on shoulder day if you don't go to failure, or you can do it after all your heavy presses for 3 sets of 10-15 reps.
Make this a smooth motion. Hold your breath to ensure your torso is stabilized, breathing out at the top of the rep. Instead of gripping the weight, the load is on your shoulders. If you don't have straps or otherwise start to lose your grip when holding weights, shrugging in this manner can help you do a few more reps.
Do this one instead of your normal upper traps exercise for 3-4 sets of 8-12 reps. If you're training in a tank top, be sure to put a towel over your shoulders so your skin doesn't pull against the pads, which can be uncomfortable. This variation of an Olympic lifting move is also useful for CrossFit trainees. While it also targets your upper body, doing a squat after meeting the bar will wear out your quadriceps in a hurry. Do this after your traditional squats for 2-3 sets of 8-10 reps with moderate weight. Because it's a rather complex move, take time to learn the precise motion before adding heavy weight. 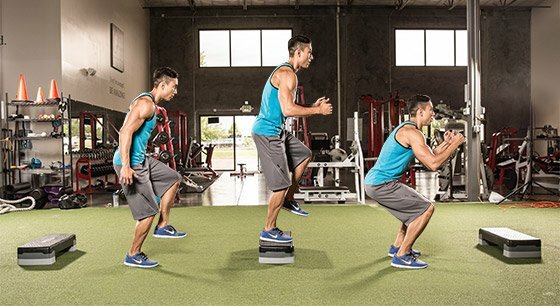 You need two boxes lined up about eight feet apart for this plyometric bodyweight move. Do this exercise first in your hamstring workout for 3 sets of 10 reps, or on your off-day from training as long as you're not training any thigh muscles within 48 hours. As with plyometric moves, use an explosive motion to rise up as high as possible off the boxes. While this movement is commonly done with the EZ-bar or even dumbbells, the power band version provides a whole new feel. Finding the right resistance of power band is probably the biggest challenge. Because adjusting the load is next to impossible, we're going for high-rep burnout sets here. Do 2 sets at the end of your workout for 20-25 reps—or as many as you can do. You'll get a killer pump. Keep your upper arms locked perpendicular to your body, bending only at the elbows. It's easy to cheat and generate body English on most biceps moves, but it's tough to cheat this particular exercise. You can also try it with a rope attachment to better work the brachialis. Because your body is supported on a bench, this is a better isolation exercise, so you can't go too heavy. Do it toward the end of your biceps workout for 3 sets of 10-12 reps.
Keep your upper arms perpendicular to the floor throughout; any movement at the shoulder joint takes muscular emphasis off the biceps. For comfort, try an EZ-bar rather than a straight bar. What do the world's toughest strongmen do to strengthen their grip, core, and forearms? This is the exercise. It's not done for traditional reps like other bodybuilding moves, but rather for distance or even time. Do these at the end of your arm or shoulder workout because, once your grip fatigues, you'll be toast at the gym. Go for 3 sets of 50-100 steps. Don't use straps if you want to train your grip. 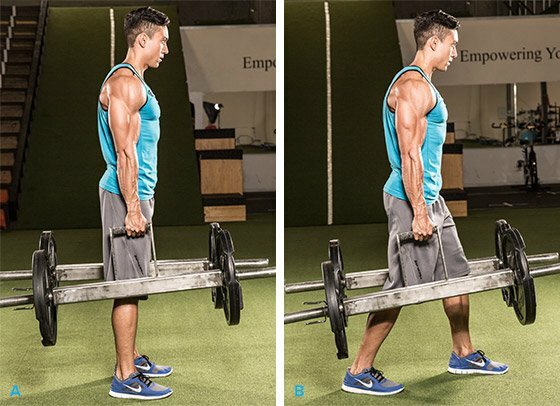 Grab a pair of heavy weights and take quick, short steps, trying to go farther each workout. This one is also popular among the strongman community, and some powerlifters have used it to build lower back strength. Make sure you're in a power rack with the safeties set. For spinal safety, make sure to never round your lower back. Do 4 sets of 15-20 reps to help strengthen the lower back musculature, which along with the abs is responsible for keeping your core tight during standing exercises; don't try to use heavy weights for low reps with this muscle group. Do lower-back exercises at the end of your workout because for all intents and purposes once these muscles are fatigued, you won't be able to do any additional standing exercises afterward. Many gyms don't have standing calf-raise machines, so this Smith version is as close as it gets. The machine locks you into the vertical plane. Do 3 sets to failure with moderate weight at the end of your leg workout. Place a block directly under the bar and make sure it's stable on the floor. You can also set the machine's safety bars at the bottom of the range of motion for ease and safety. You can do this bodyweight exercise anywhere—literally. Not only will these help you carve out those "bricks" in your six pack, but they'll also help you target your obliques better than a traditional crunch. This bodyweight move is pretty easy, so do it after your weighted ab exercises when you're already somewhat fatigued. Do 3 sets of as many reps as you can. Use a controlled motion—using any momentum here means you can probably do endless repetitions. Squeeze hard in the peak-contracted position for a count. The key to a killer workout starts hours before you hit the gym. Here's what 5 Cellucor athletes do to prepare their minds and bodies for a great training session.